Shelby – Available for Adoption! 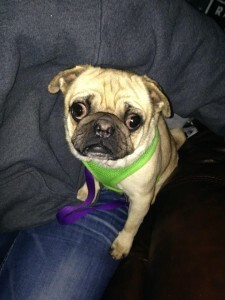 Shelby is a cute and loving pug looking for her furever home. She loves to play with stuffies. She likes to explore the outside world while following around her foster brother and sister. She loves kids and gets along well with other dogs. She doesn’t seem to mind or care about the cat. Her favorite thing though is to sit in someone’s lap and get love. Shelby will need a fenced yard and if there are other dogs in the home, they will need to be docile. She is a puppy mill survivor so she is a little skittish around loud noises. Her knees can become sore on occasion from living in a cage the first 2 years of her life, but it doesn’t stop her. Sometimes she just wants to be carried up steps – she’s a diva!